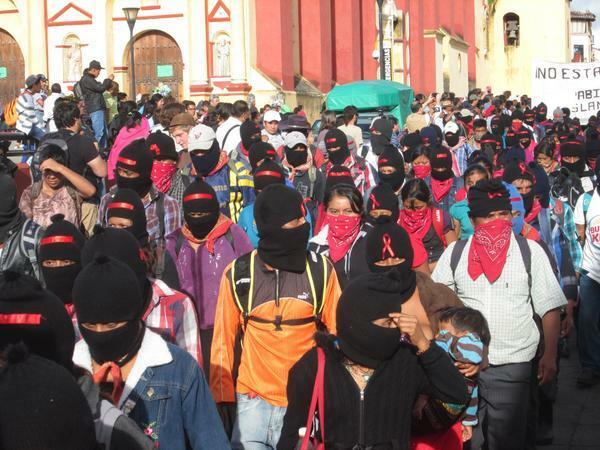 Some 20,000 indigenous men and women, milicianos and support bases of the Zapatista National Liberation Army (EZLN) among them, held a silent mega-march in solidarity with the students in Ayotzinapa, Guerrero. With slogans like “your pain is our pain,” “you are not alone,” and “your rage is ours” on banners and signs, EZLN members came from the five Caracoles that bind the five Good Government Juntas together to San Cristóbal de Las Casas in dozens of trucks and got out in the west, at the exit for San Juan Chamula. Some of the indigenous traveled up to 12 hours to get to this city from their communities in the heart of the Lacandón Jungle. Chols, Tsotsils, Tseltals and Tojolabals, milicianos and support bases of the EZLN arrived wearing ski masks and paliacates tied at the neck. They formed five lines and headed towards the center of the city, entering through San Ramon Street until reaching the central park. They passed in front of the municipal presidency and returned on the parallel street to the city’s exit. The EZLN flag and the Mexican flag were in front of the contingent. Among the Zapatista commanders, Comandante Tacho, a member of the Comandancia General del Comité Clandestino Revolucionario Indígena-General Command (CCRI-CG), could be seen with a radio in his hand for communication. The Zapatistas did not make any stop or any pronouncement. All those wearing masks, men and women with babies in their arms, left the same way they arrived. Like the Zapatistas, thousands of teachers added themselves to the solidarity march with the Ayotzinapa students, three of whom were murdered and 43 more are still disappeared. In San Cristóbal, Tuxtla, Palenque, Comitán, Tapachula, Motozintla and other Chiapas cities, some 45,000 teachers from the National Coordinator of Education Workers (CNTE) went to the streets and chanted: “They took them alive, we want them alive,” “Guerrero endures, Chiapas rises up” and others. Normal school students from all over the state of Chiapas joined them, in San Cristóbal, the Jacinto Canek Normal School, the School of Social Sciences, the National Front of Struggle for Socialism (FNLS), the Emiliano Zapata Proletarian Organization (OPEZ, its initials in Spanish) and other social organizations.